It took a while, but they finally did it: on Saturday, Rowe Racing took their first victory of the 2015 season. It’s been a long time coming, as the squad from St. Ingbert has been at the front all year long. At VLN’s 38. 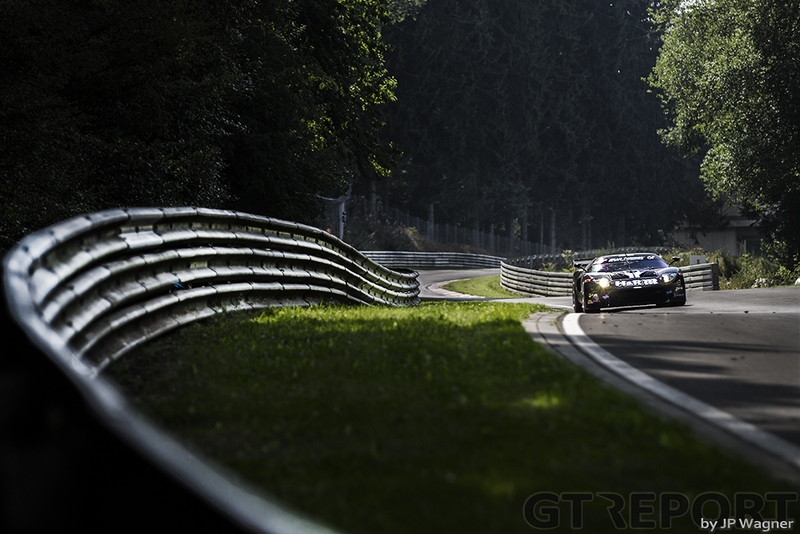 RCM DMV Grenzlandrennen, the Mercedes-Benz SLS AMG GT3 outfit finally took that long awaited win. 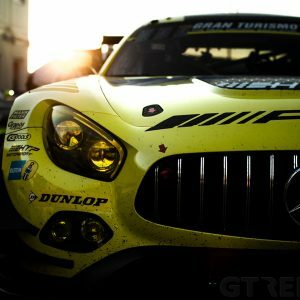 There should be no doubt by now any more that Rowe Racing is one of AMG’s top tier teams, at least at the Nürburgring. 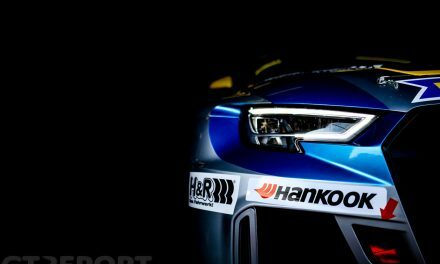 Since the start of the year the Motorsport Competence Group-run team has been close to victory many times, but missed out every time because of bad luck. 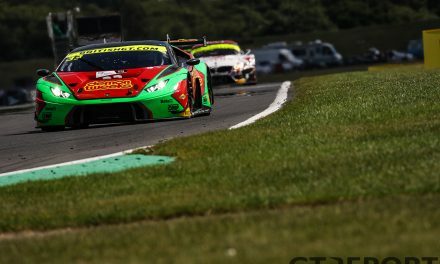 During the 24 hours of Spa drivers Nico Bastian, Stef Dusseldorp and Daniel Juncadella even came oh-so-close to taking home the trophy in the Blancpain GT crown jewel, only to fade away in the final hours of the race. 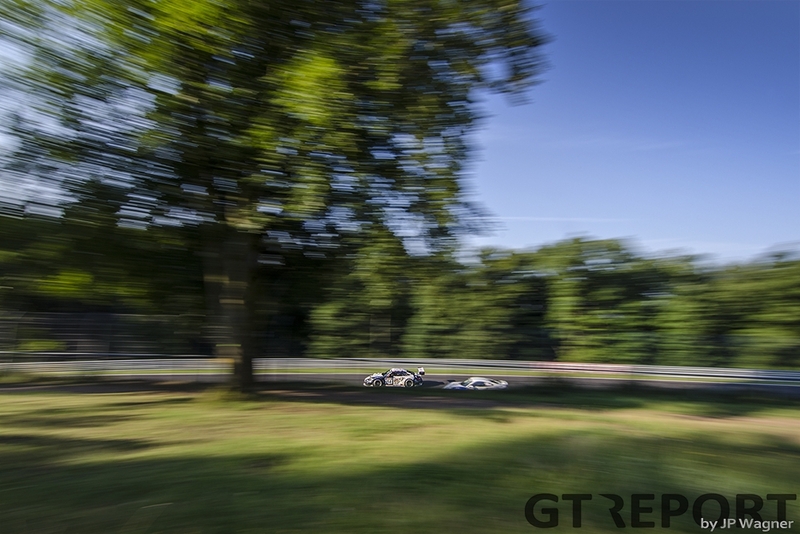 Early Saturday morning the tone is once again set by Rowe Racing as Klaus Graf puts down a stunning lap in practice. 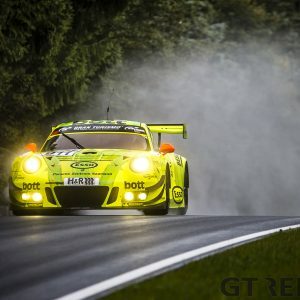 The German is back with Rowe Racing for VLN6 and claims pole position with a time of 8:02.804, breaking the 2015 lap record set by the brand new Mercedes-AMG GT3 in July. At noon, when the green flag flies, Graf’s co-driver Christian Hohenadel has to fight hard to keep Uwe Alzen in the Haribo Racing Mercedes-Benz SLS AMG GT3 off him, but fails as both cars run wide into the first corner. 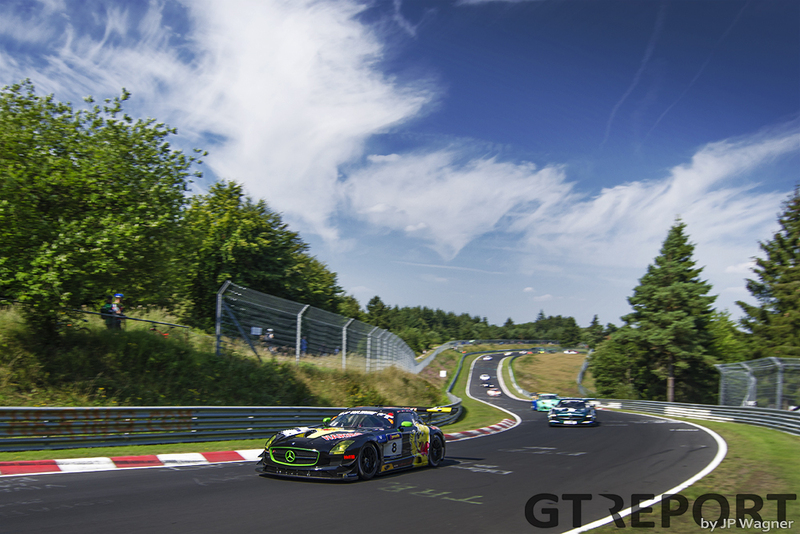 With Alzen in the lead and pushing to get away from the now second running Black Falcon SLS of Adam Christodoulou, the first group of cars rushes onto the Nordschleife. Disaster strikes when Alzen arrives at the sweeping Hatzenbach section: the Betzdorfer loses control of his car and crashes into the barriers. 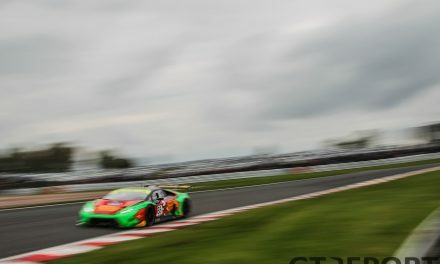 Alzen’s best efforts to bring the car back to the pits are to no avail and the experienced pilot has to retire after mere kilometres into the four hour race. Christodoulou avoids the sliding Mercedes as he inherits the lead of the race. For the next hour it’s the Brit leading as behind him cars pit early for driver changes and service. When the Black Falcon team makes their pit stop and heads back onto the track, they’re delayed by yellow flags, losing over a minute. The hold up of the Black Falcon SLS is enough for Rowe Racing to jump their compatriots, and from there on out Graf and Hohenadel aren’t challenged any more, giving the team its first victory since October last year. Black Falcon loses the race by about one minute, the same amount of time they in the yellow flag zones in the second hour of the race. 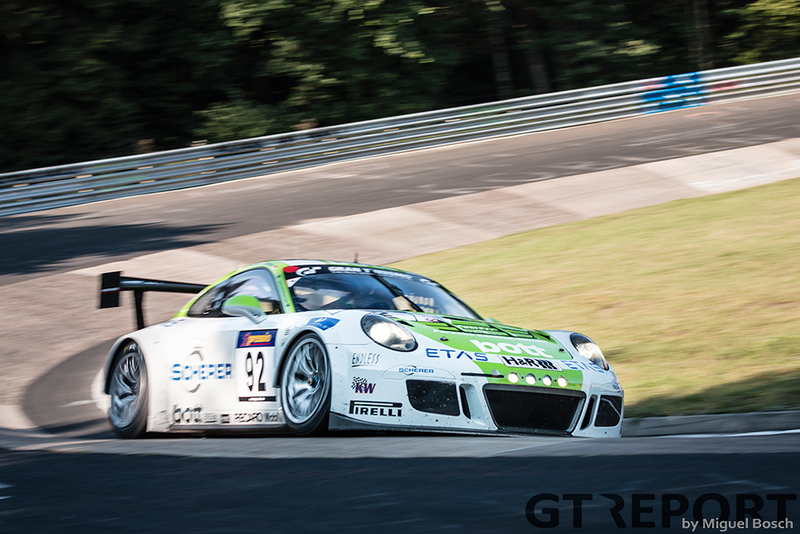 Frikadelli Racing’s day is much different from those in front of the Porsche 997 GT3R. Starting from fifth place, it is team owner and gentleman driver Klaus Abbelen who takes the duty of the first stint upon himself. Surrounded by professional race car drivers, it’s only a matter of time before the Barweiler squad drops back. 36 minutes into the race Abbelen returns to the pits to hand the car over to Sabine Schmitz. 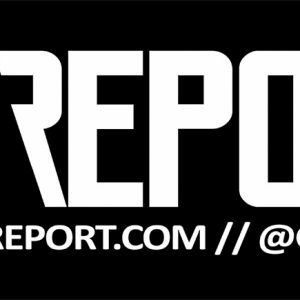 Now the race back to the front begins. 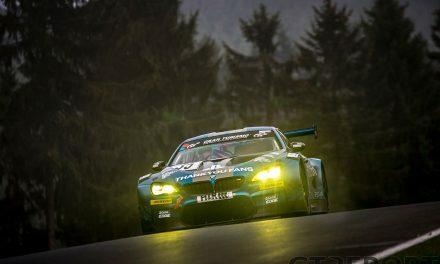 Schmitz and later on also co-driver Patrick Huisman set fast lap times and climb up to fourth place in the final hour. 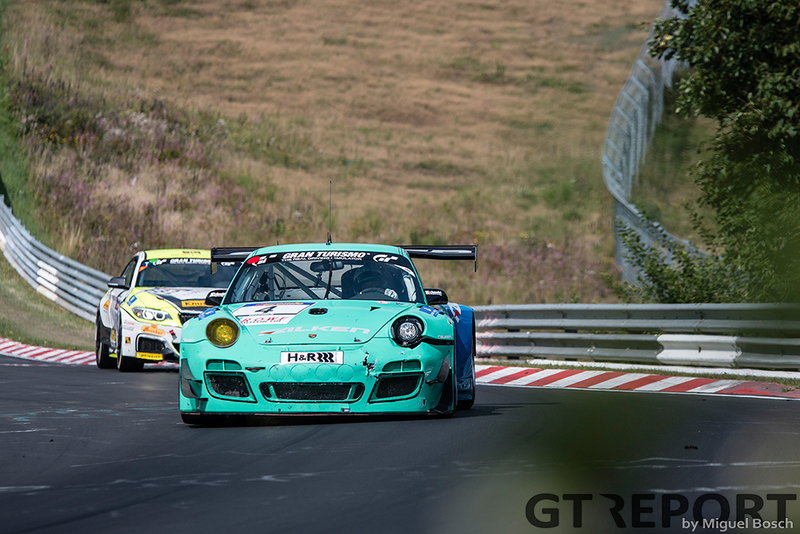 As the finish flag is waved for the victor, the Frikadelli Racing Porsche emerges onto Döttinger Höhe with the bright blue-green Falken Porsche nowhere to be seen. A minute later the Falken Motorsports Porsche 997 GT3R comes crawling down the front straight. The already battered and bruised car ran over some debris earlier in the final lap and picked up a puncture, losing what was a certain podium finish and having to settle for fourth position. 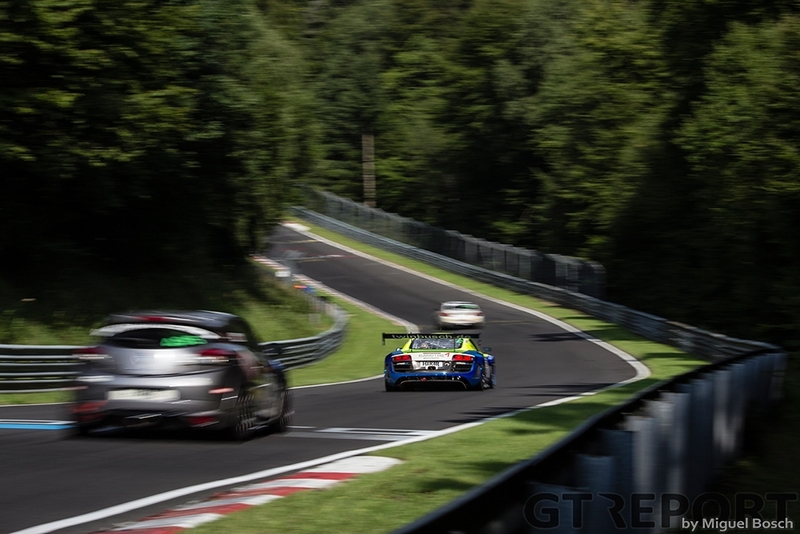 With their third place finish, Frikadelli moves into the unshared lead of the Speed Trophäe, leaving the number 36 Walkenhorst BMW Z4 GT3 seven points behind. 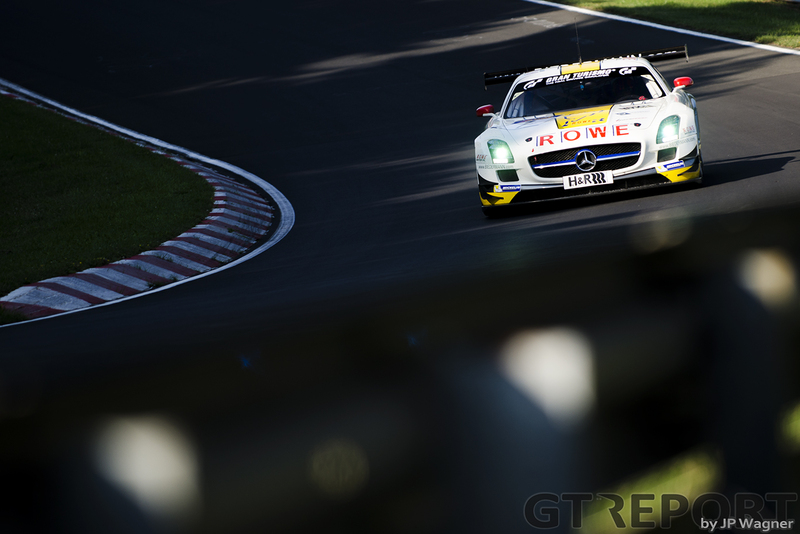 Rowe Racing came to VLN6 with the purpose to prepare, but left the track on Saturday evening with a dominant win. 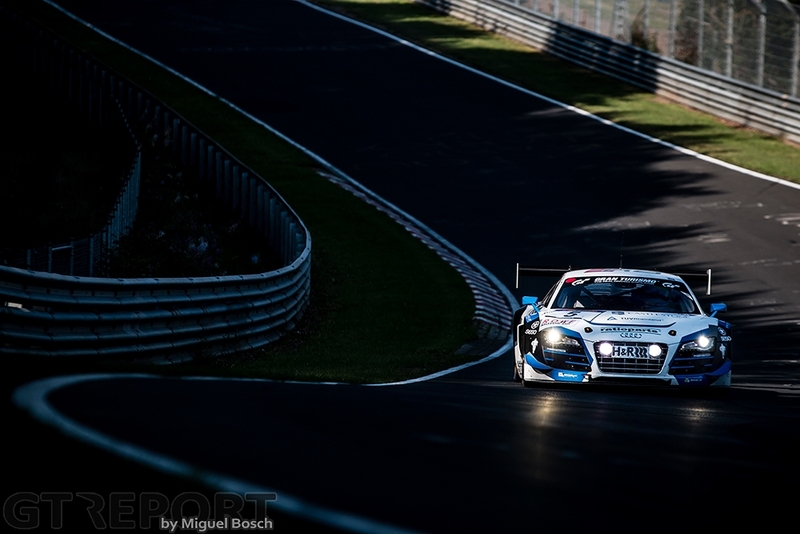 Two weeks from now the team returns to the Nordschleife for the Opel 6h ADAC Ruhr-Pokal-Rennen, the big one on the VLN calendar and the one they were preparing for. And for good reason: Rowe Racing has won this event three years in a row, and now look to be in perfect shape to make it four.